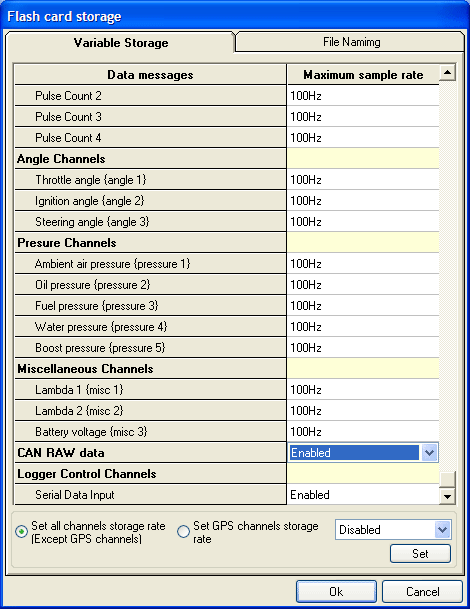 The RAW CAN reception option on the DL1 PRO and DL1 WP logs ALL of the data on the CAN bus, irrespective of what the message length, ID length, address or data values are. This data can then be analysed in the Analysis software on a PC. The data cannot be displayed on a DASH product as it is not decoded. The feature can also be used to convert CAN data to RS232 data. For the reception to work the bit rate must be set correctly. Storing RAW CAN data on the SD card. In the Flash card storage screen of the configuration software, enable the CAN RAW data option to turn storage on, this is enabled by default. To transmit the RAW CAN data on the serial port enable the option at the bottom of the 'Output serial data screen'. Note that it is very easy to overrun the serial port on the data logger as the CAN port can run much faster than the serial port, this should only be used for debugging and is turned off by default.